Manoharam is a South Indian sweet made during festivals and functions. Manoharam in Tamil means beautiful. There is a practice of giving manoharam paruppu thengai (cones) as seer during brahmin marriages and family functions. Usually it is done with thenkuzhal. My mom and grandma makes this with oosi thenkuzhal. I have posted oosi thenkuzhal recipe earlier. For a change I also made it with oosi thenkuzhal and the sweet will be an easy bite even for elders. Click here for Manoharam made with regular thenkuzhal. Click here for Oosi thenkuzhal recipe. Cardamom powder - 1 tsp. NOTE: There is no hard and fast measurement for jaggery syrup. Just add syrup to bind the thenkuzhals. Adding more will make this manoharam soggy because oosi thenkuzhal is very thin. Crush oosi thenkuzhal into small pieces in a bowl and transfer to a wide plate. Crush and powder jaggery. Dissolve in half a cup of water, strain without any dirt or mud. Heat jaggery and make soft ball syrup out of the jaggery. Drop a little of jaggery syrup in a cup of water, and using your hand try making a soft ball. This is the perfect consistency for the jaggery syrup. Add cardamom powder. Mix well. Add jaggery syrup to the crushed thenkuzhals. Mix well with a spatula. 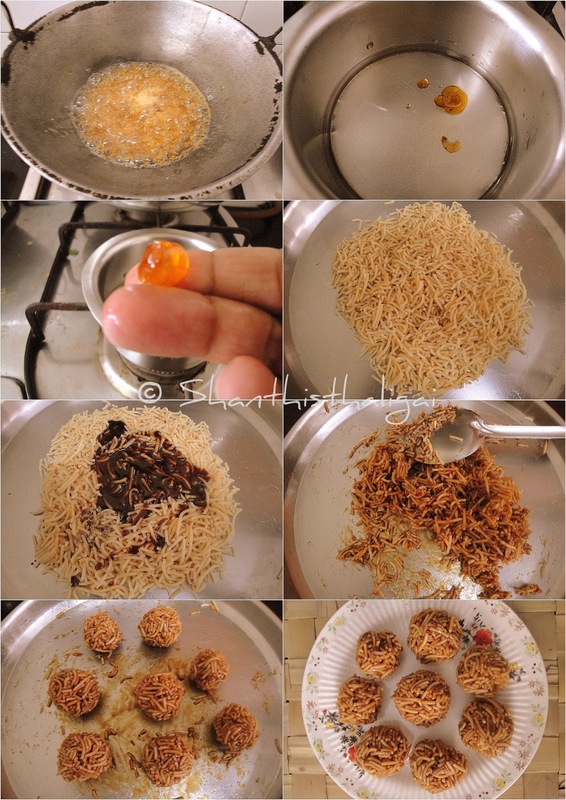 Grease your hands with ghee and make rough balls out of it. When still warm and tighten and shape to even sized balls. Delicious Oosi thenkuzhal manoharam is ready.